Designed to improve the flow and delay the drying of paint on the needle while airbrushing. 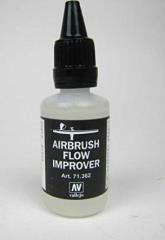 It is recommended to ad 1-2 drops of Flow Improver to 10 drops of paint in the cup of the airbrush. 32ml plastic squeeze bottle.